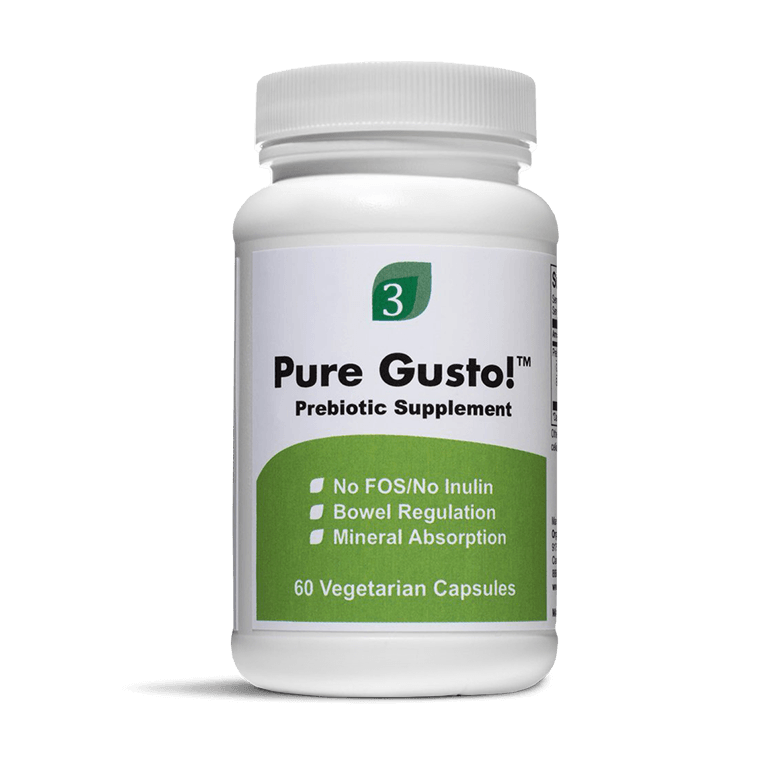 Pure Gusto™ works synergistically with probiotics to restore and maintain a healthy, balanced gastrointestinal microflora. Try it and enjoy a bit of gusto in your day! With a total of 60 convenient vegetarian capsules, Pure Gusto™ may be taken by children or adults and may be particularly suitable for infants and the elderly. This product is free of the following common allergens: milk/casein, eggs, fish, shellfish, tree nuts, peanuts, wheat/gluten, yeast and soybeans. It contains no artificial colors, flavors or preservatives. We also have Pure Gusto™ in powder form. Promotes a healthy balance of intestinal microflora: A diverse population of "friendly" bacteria colonizes the gastrointestinal tract and exerts a key role in health and well-being. By serving as a food and energy source for beneficial bacteria, prebiotics help stimulate the growth and activity of a healthy intestinal microflora. Pure Gusto™ provides galactooligosaccharides, a type of prebiotic that naturally occurs in human and cow's milk that stimulates the growth of healthful Bifidobacterium and Lactobacillus species in the gut. Prebiotics are a type of soluble dietary fiber with the ability to selectively support the growth and activity of health-promoting bacteria normally found in the gut. Prebiotics can also support the growth and activity of "probiotics" such as Lactobacilli or Bifidobacteria that are often consumed in dietary supplements or foods such as yogurt. Galactooligosaccharides, Beta-Glucan (purified from Saccharomyces cerevisiae).